Shoaib Malik killed two birds with one stone when he struck a six to reach his 9th ODI ton and handed Pakistan the series 2-1 after cruising to a six wicket win over West Indies Tuesday at Providence. It was the two respective knocks from the veterans Malik and Mohammad Hafeez who added 113 runs which bailed their team out of trouble. Malik, who stroked an unbeaten 101 decorated with 10 fours and two sixes, the last off West Indies captain Jason Holder capped off a good innings for the visitors who received cheers from the few thousands in attendance following their stylish win. Mohammad Hafeez who crafted 81 off 86, his second 50-plus score of the series; supported the centurion well and allowed the hosts to ace their chase of 233 with wickets and overs to spare. Batting for the West Indies was led by Shai Hope who struck an elegant 71 with two sixes and a four and Jason. 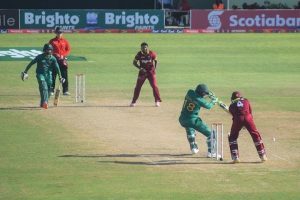 Mohammed who continued his sublime batting form with an aggressive 59 as the pair added 101 for the fourth wicket, which was the backbone of the West Indies 233-9 in 50 overs. Shannon Gabriel (2-60) was hostile during his opening spell, removing Kamran Akmal (00) before knocking over centurion of the last match Babar Azam for 16. Skipper Jason Holder (1-37) got into the action soon after when by accounting for the dismissal of Ahmed Shehzad who was caught by Hope for 3. Hafeez batted with composure to reach 50 from 58 balls while Malik knuckled down as the experienced duo help bring up the Pakistani 100 in the 22nd over. When off-spinner Ashley Nurse (1-40) broke the partnership, Skipper Sarfraz Ahmed (24*) along with Malik who steered the ship home. Left-arm fast-bowler Junaid Khan (2-60), got the first breakthrough when Evin Lewis was out caught by Hafeez for 16 while in-from pacer Hasan Ali (1-29), made a mess of Chadwick Walton’s stumps, ending an aggressive innings of 19 off 23 with three fours. Kieran Powell hung around for 34 deliveries to get his 23 runs before Wasim (1-24) had him easily stumped by the skipper Ahmed, reducing the hosts to 68-3. Mohammed’s drive off leg-spinner Shadab Khan (2-57) through the covers for four in the 26th over, broke the shackles for his team who went nine overs without a boundary thanks to the discipline of the Pakistanis bowlers. At the end of 30 overs the Caribbean side had raised their hundred with Hope and Mohammed settling in nicely as they rebuilt the innings. The two added a resurgent fifty partnership with Mohammed reaching his half-century off 59 deliveries with three fours and two sixes. Hope, the following delivery also reached his milestone which featured just one boundary and required 97 deliveries. With 10 overs remaining, two set half-centurions reached their first 100-run partnership off 129 balls to help bail their team out of a ditch. A nothing shot off Khan brought about the end of Mohammed who was caught behind by Sarfraz while Jonathan Carter was bowled by Khan for Hope continued to find the rope and beyond with a few huge sixes. Left-arm quick Mohammad Amir (2-39), then mopped up the tail by removing Holder (12) and Permaul (08), leaving Nurse unbeaten on 10.